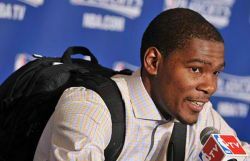 Kevin Durant and his backpack are as inseparable as hamburger and French fries. The 6-foot-9, 230-pound Oklahoma City Thunder forward is lighting up the ongoing Western Conference finals with a two-game combined total of 64 points. 12 rebounds and 8 assists. That series with Dallas is tied at 1-1 with Game 3 scheduled tonight in Oklahoma. But the aforementioned backpack is getitng equal, if not more, notoriety, than the 22-year old's eye-popping statistics. He owns backpacks of the same sizes but of various types and colors. He lugs it with him before and after games, and onto post-game press conferences. Why does Durant like the backpack so much? What's inside it? And why is it so attached to him like a tank of oxygen? Nobody knows. But everyone is speculating. Maybe Kevin misses the good 'ole days in hgh school. Or maybe he's taking special classes on lay-ups and 3-pointers. Or perhaps, wearing a backpack is simply his swag ---- which is teenager parlance for swagger. Is Thunder reserve guard Nate Robinson in the backpack? One TV analyst once asked as a joke, but the 5-foot-nothing Robinson ain't laughing. The answer, of course, is a definite no. I have no clue what's in the backpack, but I'm prety sure it's not something remotely suspicious or, ahem, illegal. Because Kevin is a stand-up citizen who reads the Bible before he shoots a jumpshot. And besides, security at NBA arenas is tighter than skinny jeans. Goodness gracious, the world didn't end Saturday afternoon as boldly and wrongly predicted by some religious naysayers. But that doesn't mean myths and mysteries no longer exist in this Earth we live in. Perhaps we will never know what the deal is with Kevin Durant and the backpack.